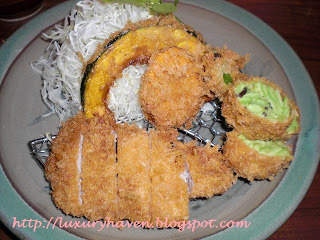 Tonkatsu is Japanese favourite. It’s breaded deep-fried pork cutlet, sliced into bite-sized pieces & served with shredded cabbage. Either a Hire (pork fillet) or Rosu (pork loin) is used. I was told that Katsukura, a Tonkatsu chain in Japan, serves one of the best Tonkatsu in town. My family & I were introduced to the outlet located right at Takashimaya, Shinjuku, for our lunch. 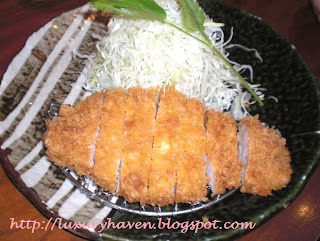 My Japanese friend said that Tonkatsu fans usually prefer the Rosu & highly recommended us to have that. But I saw a mixed dish in the menu – Hire + Yasai. Since everyone ordered the Rosu, I wanted to try a different one. Besides, I needed some vegetables to go with my fillet. 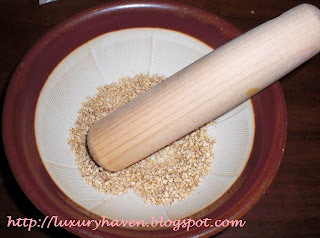 Before our Tonkatsu arrived, we were given a motar to grind the sesame seeds. The DIY was fun & I love the smell of the sesame filling the room. After grinding, there were choices of sauce to be added. 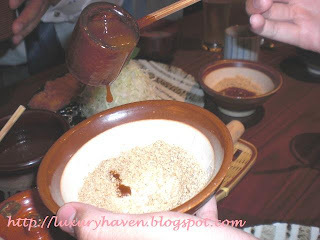 Tonkatsu is most commonly eaten with a type of thick Japanese Worcestershire sauce that uses pureed apples as a principal ingredient & often with a bit of karashi (Japanese mustard). My crispy tender pork fillet finally arrived after an anxious wait. I was happy with my selection. I love varities & on my plate were pumpkin, brinjal, yam & something I’ve yet to try – it tasted like えだまめ(枝豆), those bean pods usually served cold in Japanese restaurants. I like the taste, very unique. I quickly traded a piece of my Hire for Rosu & I’d the best of both worlds. The Hire was somewhat tenderer but the Rosu has some fats on the meat which melted in my mouth. Both were heavenly. If you’re ever in Japan, do visit the reasonably-priced Katsukura, which has outlets in Kanto, Kyushu area etc.